I'm a mom, so keeping my family safe and healthy is very important to me. I've also been trying to institute more eco-friendly practices into my family's life. From recycling to purchasing more recycled materials, every thing we change up has a positive impact on our lives as well as the Earth. One thing I have cut out completely (even prior to this review) is bottled water. I've read so many studies that say that the plastic that the bottles are held in could be cancerous, as well as how long they take to break down in a landfill. That's why when I was approached to do a review on the Zuvo Water Filtration System (aka Zuvo Water Purator ), I jumped at the chance. Zuvo offers user friendly new technology that reduces unwanted, potentially unhealthy contaminants in drinking water -- without stripping it of the trace minerals that give water its refreshing, distinctive taste. It works in real time with no waiting. No other water cleansing system can make this claim of cleanliness combined with good taste. 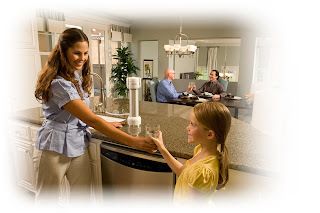 This small home water treatment appliance is based on a patented technology platform that reproduces the photo-oxidation process naturally occurring in the environment (go to www.zuvowater.com for a more detailed explanation of the five-step process). It is an easy-to-install, cost-effective device ($.06 per gallon, compared to more than $1 per gallon for bottled water, over the course of a year) not requiring interim plastic pitchers or chemical additives. As an added bonus, eliminating the use of bottled water helps reduce the 32.8 billion water bottles that end up in landfills every year and it requires fewer filter changes that the famous name brand filter systems on the market. The Zuvos retail for $299.99 and are way more cost effective than disposable filter brands. "Individual and families have many opportunities to reduce or eliminate chemical exposures, filtering home tap water or well water can decrease exposure to numerous known or suspected carcinogens or endocrine-disrupting chemicals." The report further points out that children are at special risk for cancers from environmental contaminants due to the numerous toxic by products that leach into drinking waters from plastic bottles and unfiltered tap water. There is a solution to this cancer risk. Families can get unlimited quality water for both drinking and cooking directly from their faucets with an affordable Zuvo Water Home Filtration System. After all the recent news lately on the perils in our drinking water, and because tap water safety is a number one concern for our health and fitness this is exactly the problem the new Zuvo tackles. We all know the reasons we need to drink more water: hydration, healthier bodies, better energy, exercise aid, cooking, the list is endless. The new Zuvo Water Filtration System, is a new easy to use eco friendly device,it's state of the art and elegantly designed. In light of all the recent FDA warnings over plastics leaching into our bodies from unregulated bottled waters, this is especially timely. With the safety of drinking water on everyone's minds these days and Congressional hearings on bottled waters ongoing, the new Zuvo Water Filtration System offers a solution to the question of how we can get the cleanest drinking water to improve our fitness and health and at the same time save our planet.The Zuvo Water Filtration System will revolutionize the way you think about easy to use home water filtration systems. It's ecologically friendly and elegantly designed and has been awarded the Parent Tested Parent Approved Award for best new green products, recommended by the Cooking Clubs of America and we're on track for the Good Housekeeping Seal too. Just because children have smaller bodies does not mean they need less water. Water is in fact one of the most important nutrients for children. And because our bodies are 75% water, we can’t live without water and can survive only for about three days without it. The fact that your readers turn to you for the latest in healthy eco friendly products and advice, Zuvo should be a perfect fit. Zuvo raises the bar for water purity and taste. (ranked #1 over Fiji, Aquafina, Brita, Pur, Aquapanna, Evian and Smart Water by the San Francisco Chronicle and Wine & Spirits Magazine) at the most cost-effective price, Zuvo eliminates the need for expensive and eco-unfriendly plastic bottled waters, in fact if the water we use at home cost what even cheap bottled water costs our monthly water bills would run about $9000.00. In addition the statistics surrounding the diseases and pollutants found in tap water are astounding. More and more individuals and families are starting to invest in water purification systems in order make sure their water enhances their health, rather than diminishes it. Please visit www.zuvowater.com to learn more. As a Cancer-survivor, you could say I'm a bit paranoid about cancer. I've had it once and I don't want to have it again! If I can reduce my risk just a little bit by using the Zuvo Water Purator, I can sleep a little easier! I've always hated the taste of water (or should I say the LACK of taste?!) People used to laugh at me on one of my recent jobs, because I used to tell them I HATE water. They didn't understand. I can't even explain it - I just HATE it! The only way I would drink is it if I bought bottle water. I cannot drink tap water! at all! One of you will win a Zuvo Water system like I received for review! This giveaway will end on August 12th. Winner will be emailed, so please be sure to leave your email address in your comment. I learned that filters should be changed at approximately the 500 gallon point, or 6 months, whichever comes first. WOW!! it takes 47 million gallons of oil to make all the plastic water bottles we drink from eat year. CRAZY!!!! I learned that bottled water is typically no safer or healthier than tap water and chemicals can even leach from plastic bottles into water. I know that the Zuvo filter does not remove flouride from your water which is good for your teeth. I like how you can get fealthy, clean, great-tasting water right from your tap. I learned that the Zuvo Water Purator comes with a filter that only needs to be changed every 500 gallons or 6 months! The smartly-designed Zuvo Water Purator™ fits in any kitchen... either above the counter or under the counter. I learned that The Zuvo Water Purator combines UV and ozone in a patented process known as photo-oxidation which releases powerful oxidizers to further treat the water. 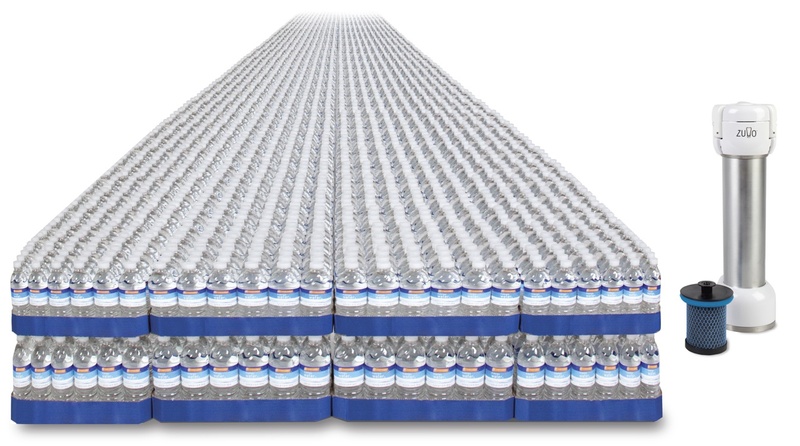 47 million gallons of water used for plastic water bottles! Yikes! I learned that bottled water is much more costly in terms of money and environment that a water system such as this. I learned that The UV Light in the Zuvo Purator is rated for 10,000 cycles. Zuvo believes this represents a 7-10 year life-cycle. Will the Zuvo Water Purator work on hard water? Yes, the Zuvo Purator works with hard water. I learned to change the filter every six month. I learned that The Zuvo Water Purator™ uses a patented five-step process to produce clean, healthy, great tasting water...just the way nature intended! I learned that it comes with a one year warrenty and that over the longterm you end up saving money because you no longer need to purchase bottled water. What a great sounding systems. Thanks for offering this wonderful prize. I learned that you only have to change the filter once every 6 months. Filter needs to be changed every 500 gallons or 6 months! You need to change the filter every 6 months. I learned 60 million bottles end up in the landfill. I entered your ice cream giveaway, thanks. I learned that the Zuvo Water Purator requires electricity, but there should be little, if any, noticeable change in your electricity bill as a result of using the Zuvo Water Purator. I learned that the Zuvo Purator works with hard water. Zuvo's patented Puration process uses nature's own cleansing process right in your kitchen. Mother Earth hates plastic water bottles. 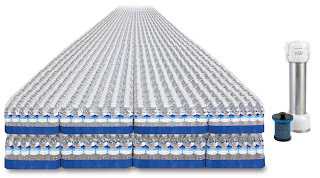 It takes 47 million gallons of oil each year to produce all those plastic water bottles. I learned that the filter should last 6 months or 500 gallons. I learned that you can buy zuvo (if you don't win here!) at drugstore.com, brookstone.com, and local retailer ferguson which I had not heard of before. It works with hard water, so that's pretty nice. I entered your penguins of madagascar giveaway! I learned that tap water may contain lead, parasitic cysts, non-pathogenic micro-organisms and unpleasant levels of chlorine. I entered the Bryers giveaway. I learned it removes lead. I learned that Zuvo is donating all profits from the sale of its line of stainless steel water bottles to Hippo Roller, a product for aiding rural villagers to transport potable water. I learned they donate profits from their water bottles to hud charity. I learned that Zuvo is donating all profits from the sale of its line of stainless steel water bottles to Hippo Roller. I learned that we can save hundreds of dollars every year buy not buying water. I learned that the Zuvo Water Purator mixes ozone with incoming tap water to treat taste and odor contaminants and improve taste. I learned that the Zuvo Purator uses a “broad spectrum” UV lamp. In addition to visible light, the Zuvo Purator UV lamp emits shortwave UV energy across a band of wavelengths from 160 nanometers to 260 nanometers (hence the term “broad spectrum”). These two key UV wavelengths are fundamental to the Zuvo performance. Now that's a hi-tech water filter! Thank you for the chance to win. I learned that when purchased the Zuvo Water Purator comes complete with a filter plus an additional filter for free. Each filter ig good for 500 gallons or 6 months whichever comes first. I am subscribed via email as jweezie43[at]gmail[dot]com . I've learned that Zuvo water purator uses 5-step process to produce clean water - using ultraviolet light in the procedure, for instance. I learned that it uses just 27 watts of power. I learned that Zuvo passes water through a Class 1 Particulate Reduction Filter, reducing chlorine taste and odor, lead, and tiny particulates. the Zuvo Purator works with hard water. I learned it takes 47 million gallons of oil to produce the plastic water bottles consumed each year . . . . Yikes!!!! I learned that the Zuvo water purator is not currently rated for reduction of arsenic. I learned they mix ozone with incoming tap water to treat taste and odor and improve taste. Ozone is a powerful oxidizer and leaves no chemical residue. I learned that the filters don't take fluoride out of water so that's important. I learned that there's more than 60 million plastic water bottles that end up in our landfills every day. Which makes me glad I have a reusable water bottle... though no purified water. Which would be nice to have. Thanks for the giveaway. I learned that over time, Zuvo costs a fraction of what you'll spend on bottled water or pitcher filters. Thank you for the lovely giveaway. I entered your Cats and Dogs giveaway. I learned the filter is good for 500 gallons. I learned that the filters can last up to 500 gallons or 6 months. Each Zuvo Water Purator comes with a filter that’s good for 500 gallons or 6 months – whichever comes first. I learned that it works with hard water! I so, so, so want this!! My husband hates water too but I know he needs to drink it as part of a healthy diet! I'd love to try this out. I learned from the website that Zuvo's product portfolio is based on a patented technology platform that reproduces the photo-oxidation process that naturally occurs in the environment. I learned you only hve to change the filter every 6 months. I learned that Zuvo uses photo-oxidation to further treat the water after UV light! I learned that the Zuvo Water Purator comes with a filter that only needs to be changed every 500 gallons or 6 months, not bad! I learned that the Zuvo helps skin by replicates nature's water-cleansing process, reducing contaminants while preserving your water's natural and healthy mineral content. Very impressive! Scstaryeyed@aol.com. Thank you! I learned the Zuvo system uses a cleansing process that reduces contaminants while preserving the water's natural and healthy mineral content.